So, thank you, Kara, for making the most perfect bag for me. Your fabric selections are fabulous -- how did you read my mind?! But what I really love about it are the things that make it uniquely Kara, things I never would have thought of doing. 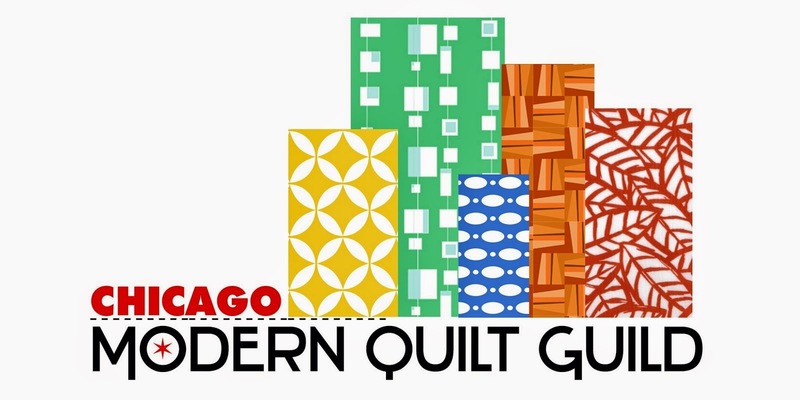 Like quilting with a zig-zag stitch, combining the fabrics in a way I never would have (but really love), and adding the aqua embroidery stitches for extra pop and texture. 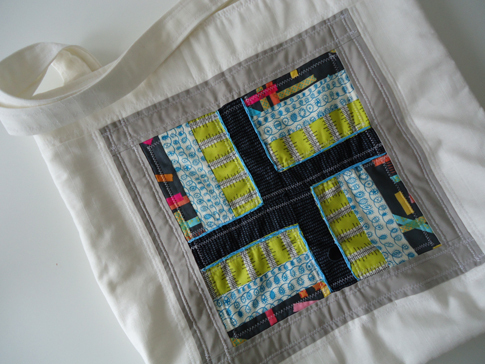 My kids say the patchwork looks like a city map, which is how I will always think of it now. And that makes me love it even more. 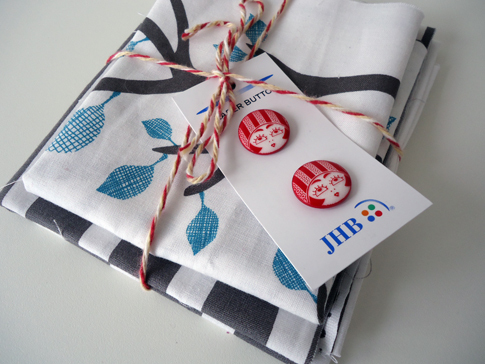 Oh, and I almost forgot about this awesome little bonus package that was hidden inside: more Lotta Jansdotter fabrics (I don't think I can ever have too much!) and this fabulous pair of buttons. Thanks so much, Kara, for this gift, and also for organizing the Secret Santa Swap. It was so much fun. My swap partner, Ros, specifically asked for a Christmas-themed gift. Since she lives in Australia (where the weather is warm this time of year), I wanted to make it Christmas-y, but also bright and cheery -- no snowmen or sleighs for her! 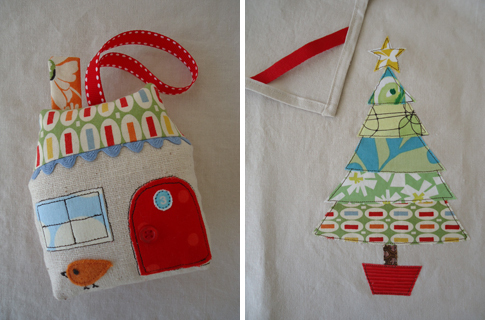 I stitched up this house ornament (tutorial by RetroMama), because I think it's adorable... and hoped Ros would, too. Then I resurrected my pattern for this Christmas tree applique -- one that I used way-back-when to make these greeting cards. [You can read more how I make the cards here.] This time I sewed the tree onto a piece of linen, which I hemmed and turned into a tea towel, complete with a strip of cheery red twill tape sewn into the corner for hanging. 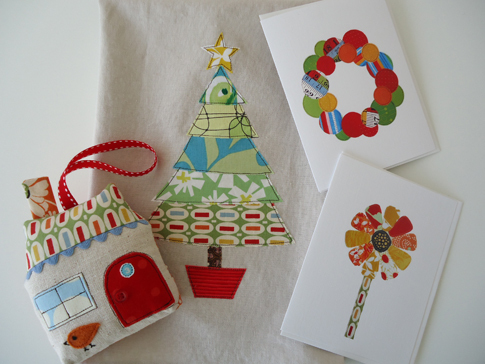 I included a couple of my applique cards to round out the package. I'm now frantically trying to get through my list of un-secret holiday gifts for friends and family... because, as usual, I have waited until two weeks before Christmas to start... or even come up with ideas. But that's just kind of the way I roll. I wish I could be more organized, but I'm just, well, not. What last minute gifts are you making? 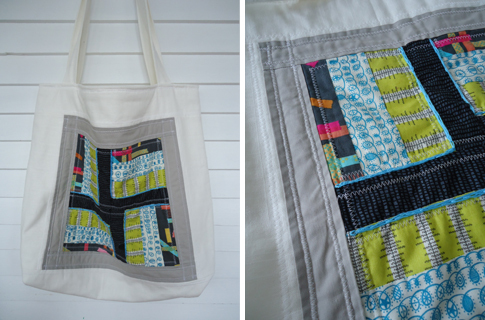 I so enjoyed reading all of your comments on my giveaway post, as part of Sew, Mama, Sew's Giveaway Day. I loved having so many new visitors to my itty bitty blog, too. Hope you'll come back and visit again! Congratulations to elflyn (comment #109), chosen by the true random number generator on Random.org. Elflyn said, "Oh so cute, I love Bella. Thanks for the opportunity." You're very welcome! I'll be shipping your zipper pouch off to you asap. Enjoy! 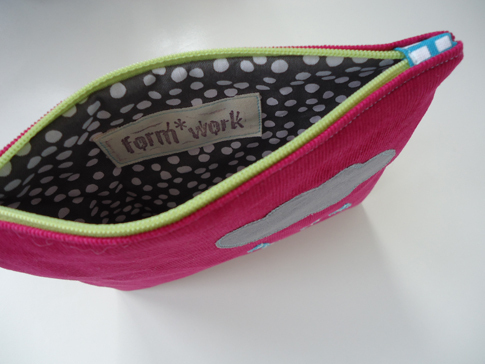 It's Giveaway Day once again at Sew, Mama, Sew!, and... once again, I have something to giveaway! Details on how to enter are at the bottom of the post. Also, be sure to check out all the other giveaways being offered. 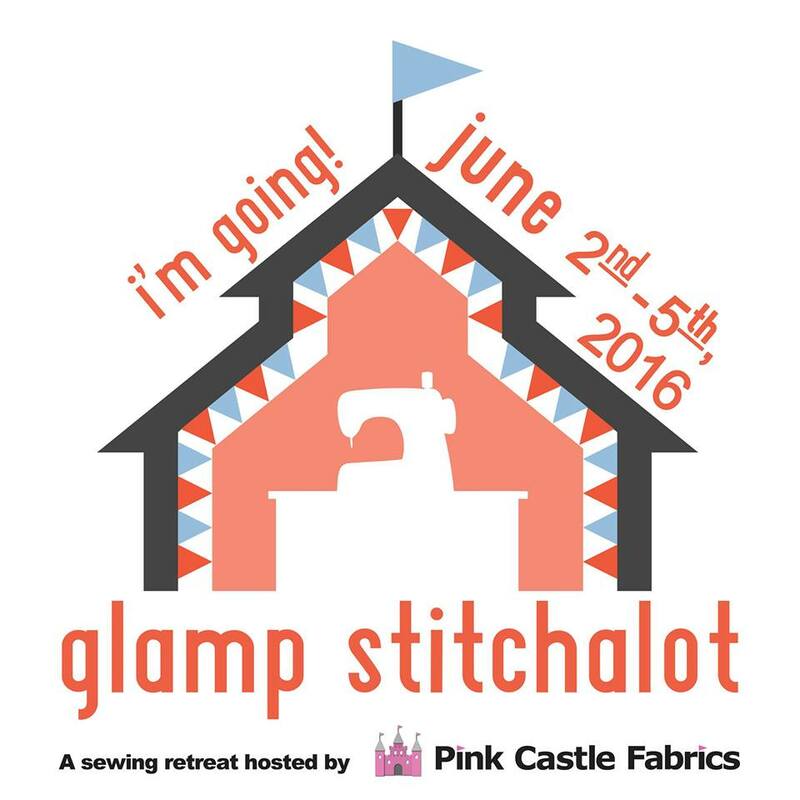 Click the image below to link back to the official Sew, Mama, Sew Giveaway Day posts. 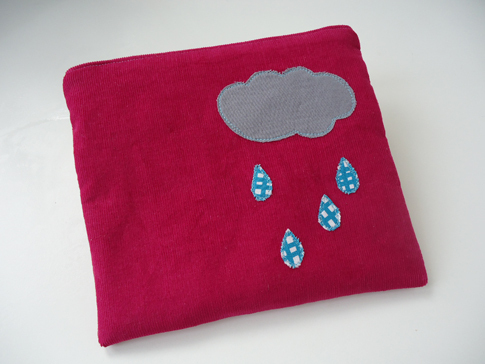 On this overcast, slightly dreary, late fall day, it seemed appropriate to offer up this cheery little rainy day pouch, designed and made by yours truly. 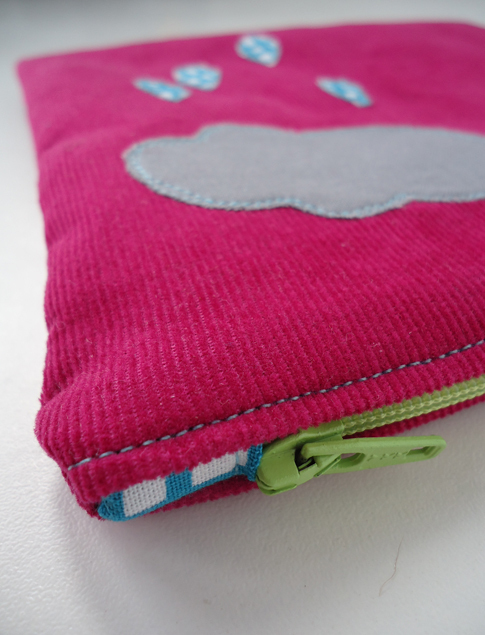 It's a hot pink mini wale corduroy zipper pouch with a cloud and raindrops applique. The lining and raindrops are from one of my favorite fabric collections, Lotta Jansdotter's Bella. To enter to win, simply comment on this post anytime before Friday, December 7 at 5 pm EST. You can write whatever you'd like in your comment. If you need some inspiration, I'd love to hear about what you're making this holiday season, whether it's handcrafted gifts or decorations, or home baked goodies. I'll use Random.org to chose the winner of this handy dandy (and cute!) little pouch. 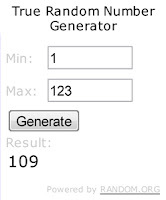 This giveaway is now closed; the winner is announced here. Thanks so much to all who participated!